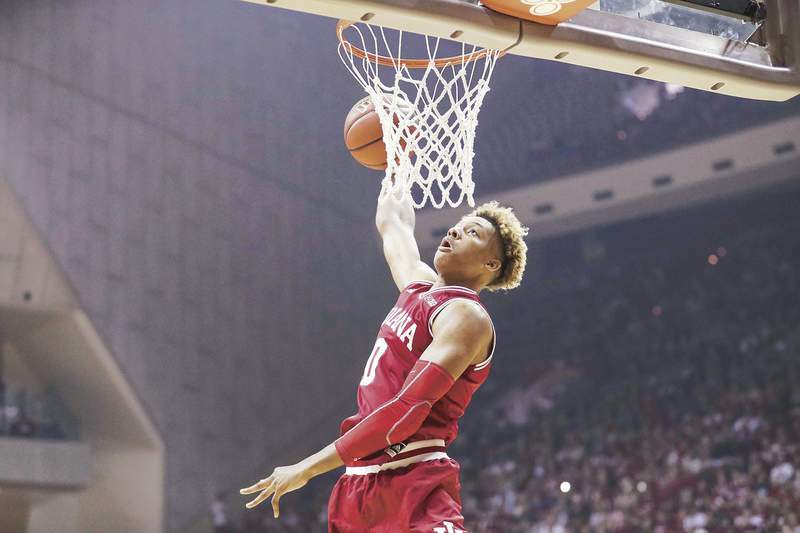 Courtesy Indiana University Indiana freshman Romeo Langford goes up for dunk during Hoosier Hysteria last month in Bloomington. The 2018 Indiana Mr. Basketball enters this season with high expectations. Romeo Langford insists he's a normal Indiana student. The reality, however, is that Langford isn't a normal student and can't be. He's the first Indiana Mr. Basketball to play for the Hoosiers since Cody Zeller (2011), the highest-ranked recruit to choose Indiana since Eric Gordon (2007) and the most important piece of a recruiting class that is supposed to lead the Hoosiers back to national prominence. So, how is he handling those expectations? Easy, he's ignoring them. Of course, that's a typical cliché-filled response that hundreds of players across the country have uttered some version of over the last month. With Langford, however, he is genuinely focused on his team's success over personal accomplishments, according to teammates and coach Archie Miller. Juwan Morgan, the Hoosiers' leading scorer and rebounder last season, came away impressed with Langford's work ethic after just a few practices. Morgan raved about one practice in which the 6-foot-6 guard worked especially hard at rebounding and grabbed “eight or nine” defensive boards. “Sometimes the stigma is you don't really expect that from somebody who has that many accolades coming into college,” Morgan said. “But (Langford)'s really doing all the dirty work and I think that's a testament to the person he is. Although he averaged nearly 10 rebounds as a senior at New Albany, that will probably not be Langford's primary job with the Hoosiers. Last year, the Hoosiers lacked a perimeter player who could get his own shot off the dribble. Langford fills that role and his playmaking ability, both scoring and finding open teammates with smart passes, figures to be his most important contribution. Miller has done little to tamp down expectations for his star freshman. Although he's acknowledged that there will be a transition period, as there is for every player moving from high school to college, the coach also compared Langford's athleticism to Randy Moss and Usain Bolt and praised his ability to raise his teammates' level of play. As a high school senior, Langford scored 35.5 points per game. He'll take plenty of shots at Indiana, as well, but projecting scoring to be his only contribution would be a mistake. He said he plans to do whatever it takes to make the Hoosiers winners. If he does lead the Hoosiers to wins, he can expect to get stopped on campus far more often.